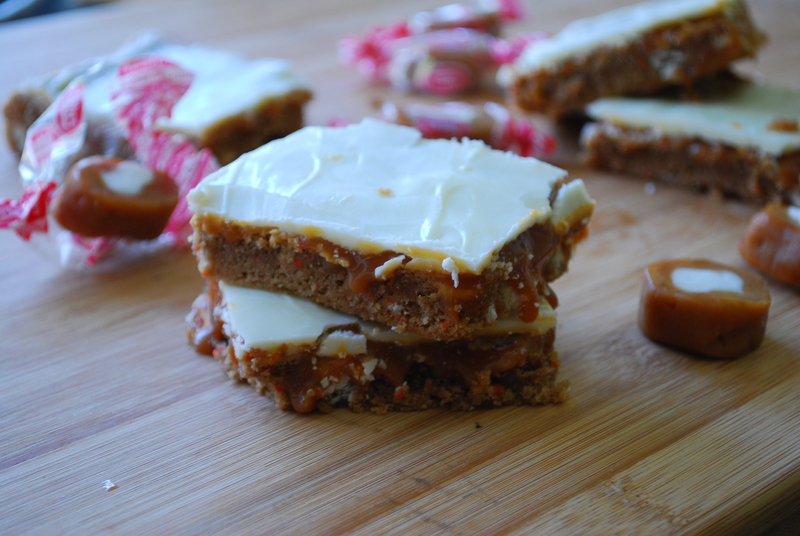 Carrot cake bars? Are you serious right now? I. Do not. Make. Carrot cake. Anything. So can someone explain to me whyyyy that’s a picture of carrot cake-something I made up there? 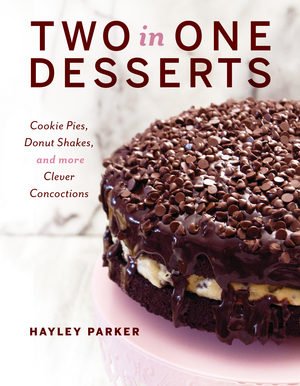 Something that looks ooey, gooey and, dare I say, good? So I know I’m not the only one on this planet (a shame). But if I were, carrot cake probably wouldn’t exist. Why? Because I dislike it with a fiery passion, along with my hatred of pork chops, when gum gets hard (ugh–the worst) and canned green beans (just… no). There aren’t many foods I dislike, but one of them is easily carrot cake. I don’t have real reasons why I hate it since I really like carrots and I’m not one of those people with a mental block of veggies inside desserts (beet brownies, zucchini cake, all good in my book). I think it’s because of really bad grocery store cakes or distasteful homemade versions in years past. My grandma (still) has holiday parties with her friends, and usually for spring-related or Easter parties, there is carrot cake involved. She always thought–for whatever reason–that Alex, my brother, LOVED carrot cake with a passion, even though he A) had never said this nor B) ever proved this. So carrot cake would always come down, big fat slices of the stuff, and go uneaten and unwanted. I think we were more likely to scarf down octopus or pig eyes than touch carrot cake with a ten foot pole. Seriously. I just. don’t. like it. Period. But again, I can’t be a selfish blogger, or else all that would happen would be me talking about my love affair with chips and obviously that blog would be less-than-stellar and mind-numbingly boring. So, I made you carrot cake. Let’s just consider this a wordless declaration of true love for you. But this isn’t ordinary carrot cake. This is carrot cake that’s gone balls out cray-cray. It’s stuffed with white chocolate chips, then topped with like, the gooiest caramel sauce, and then that’s topped with a smooth layer of white chocolate. I meeeeean, I totally love you. I feel like we’re having a Rachel and Ryan moment right now, all “if you’re a carrot cake, I’m a carrot cake” kinda thing. It’s romantical. It’s sweet. It’s holy hell, do you seeeee that caramel?!? 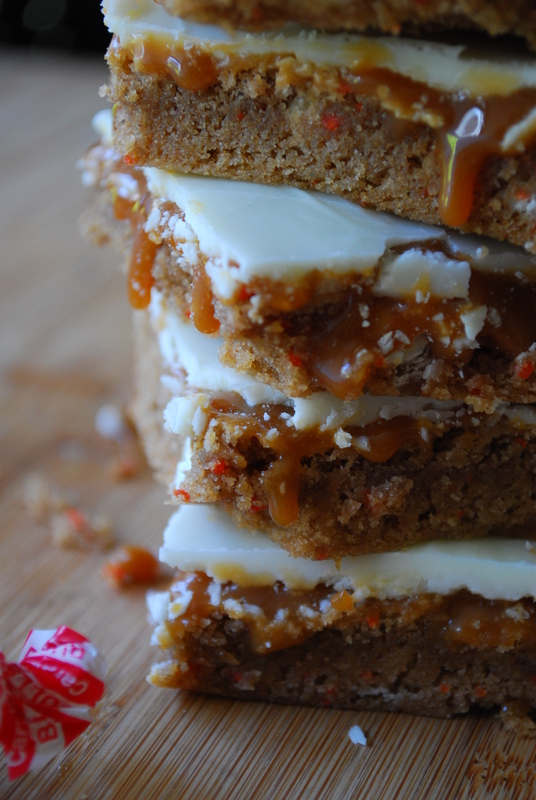 So please, carrot cake lovahs or not, make these. It’ll change yo lyfeeee. 2. 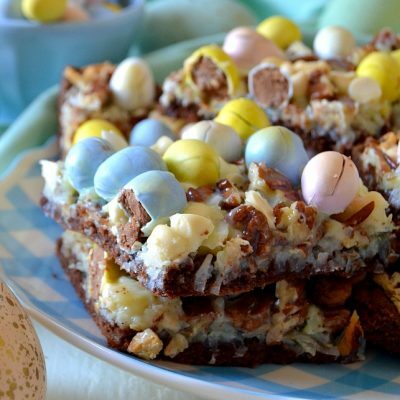 In a large bowl, combine the cake mix, eggs and oil until combined. Stir in half of the white chocolate chips. Spread mixture evenly into prepared pan. Bake for 15-17 minutes or until center is just set + edges are light golden brown. Cool completely. 3. 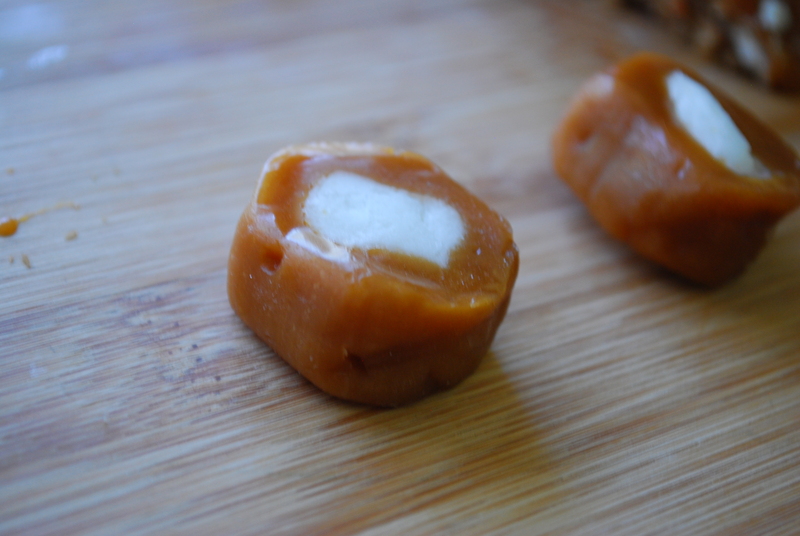 In a medium microwaveable bowl, melt the caramels with about 2 tsp water for 45 seconds. Stir, then continue cooking for another 30-45 seconds or until smooth and melted. Mixture will be very hot. 4. Pour the caramel mixture on top of the cooled bars; spread evenly. Place the pan in the fridge to allow caramel to set, about 15 mins. 5. In another microwave-safe bowl, melt the remaining white chocolate chips with a splash of oil for about 45 seconds, stirring until smooth. Pour the mixture on top of the caramel, spreading evenly. Allow white chocolate to harden in fridge, about 10 minutes. 6. Cut into bars and serve. Store leftovers airtight, at room temperature, for about 2 days. Can store in fridge, but allow to come to room temperature before eating. Holy moly. Y’all need to get in on this. Helloooo, don’t you want to live in that caramel layer? Me too. I’m not crazy about spice or carrot cake either. In fact I don’t even qualify them as cakes. But anything with caramel and white chocolate MUST be good. Gosh, I love those little caramels with the white center. I always eat the center first! Tanya–me either. I really don’t typically like them, but these were good! I LOVE LOVE carrot cake – there is nothing better than a moist, thick, raisin-loaded piece with lots of cream cheese frosting and with the caramel and white choc you used, this is great, Hayley! So. So. So. Good. Amazeballs cray-cray bars!!! I know because I tasted them. A lot. Pinned, shared, gonna make soon! Argh so jealous! I neeeeeed these! I haven’t had carrot cake in forever. My husband doesn’t like it :/ I may see if I can sneak this past him or make it for a family function! I wanted to also let you know that I nominated you for an award – well 2 actually! You can check it out on my blog, Love Bakes Good Cakes! Awh, thanks Jamie! And no one in my family likes carrot cake so no one wanted to try it, but when I convinced my sister and dad to have the tiniest bite known to man, they both said it was good, haha. Um. I like carrot cake – or at least I did until I saw these just now. These are waaaayyyyy better than carrot cake. I mean look how gooey! I need comfort food in a big way right now, send these my way please!!! I actually love carrot cake, so i’m mighty happy you posted this. =) loooove the addition of caramels, too – i can eat those chewy mofos by the dozen. also? i’m so with you on hating hard chewing gum + canned green beans. also, you can add canned tuna fish + deviled eggs to my hated-foods list. I’m sure one bite of this deliciousness could turn anyone into a carrot cake lover!! I LOVE carrot anything, and all that caramel too?! I’m in in in! I won’t waste a whole paragraph trying to convince you to love carrot cake, but I’ll instead just say that I happen to LOVE it! 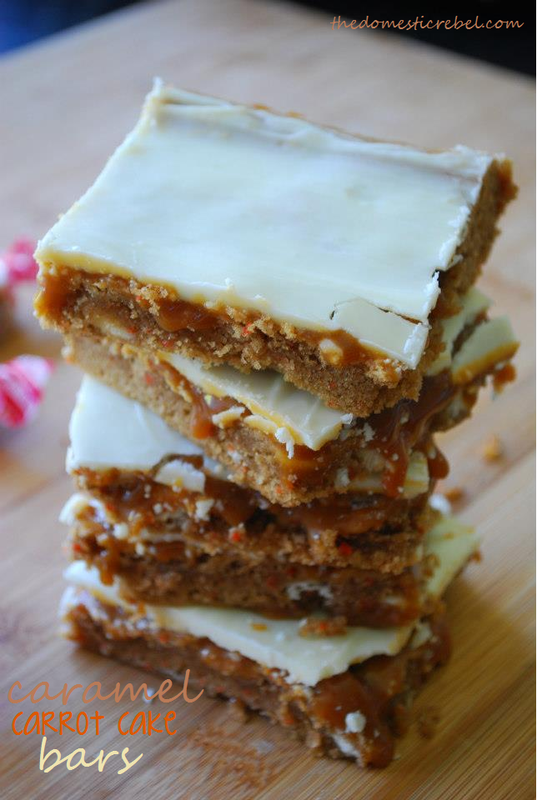 These carrot cake bars could just about complete my life. Love the addition of caramel candies! Haha Georgia, I’ve had multiple people try to convince me and I’m convinced I haven’t tried a gourmet carrot cake yet 🙂 I’m sure when I have the bite of my life, I’ll agree–but for now, these bars are pleasing me just fine! Thanks for your comment! Dude, are we sistahs from another mister? I feel the EXACT same way about carrot cake. I love veggies and carrots too but carrot cake makes me want to hurl. I’d be nervous too if you put these in front of me but I’d definitely try them. Maybe I’ll make these for the giant man-baby and taste a bit to see too. PS I could eat every.single.one of these bars. thankyouverymuch! I just love how the caramel is oozing out of these bars! They look so delicious!! I would totally eat carrot cake if they were all like this! It looks decadent but easy. Thanks for sharing this idea. Okay, carrot cake is one of my fave things EVER. It’s tragic that you don’t like it. But these bars? Look OMG amazing. 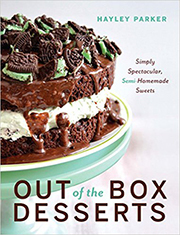 With the gooey caramel, yes please (and I am TOTALLY jealous that Dorothy got to try these!)! 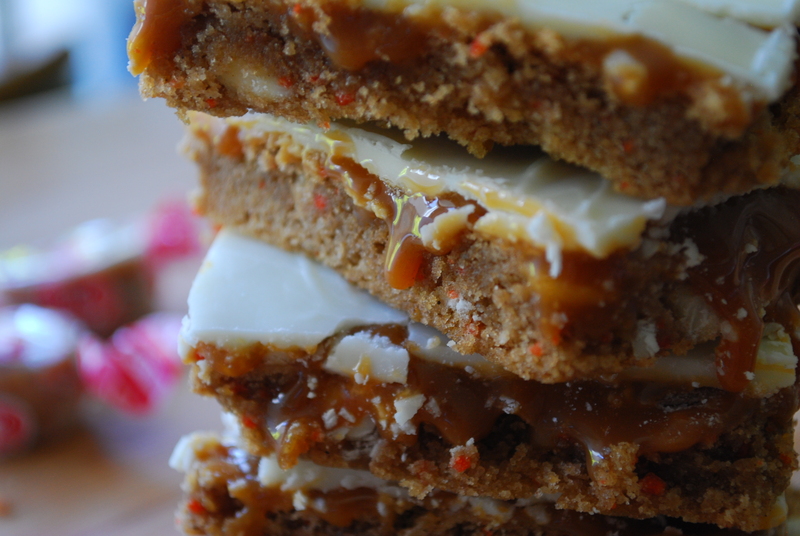 It is very sad that you don’t like carrot cake…but you made me a little bit happier with these awesome ooeey gooey carrot cake bars!!! I really want some of these tonight!!!! These were sooooo good, it isn’t even funny. I made them and had to have my hubbie hide them because I didn’t want to stop eating them. You are so amazing!!! Eek, Suzen, I’m SO glad you tried them and liked them! For not liking carrot cake, I thought they were delish and that says a lot! 🙂 thanks girl! Hahaha. I’m glad everyone–including your carrot cake hatin’ self–enjoyed them! There’s something about these that are different from the usual shudder-inducing carrot cake, I think 🙂 thanks for reading & commenting! It’s like a little taste of heaven. You’re like the Dumbledore of Baking. Want to make this soooooo badly. Where can one buy the caramels with the white centres and is the centre white chocolate?????? Hi Cheryl! You actually don’t need to buy those actual caramels with the white centers (I believe they’re called Cow tails??) you can just use regular squares of caramel!! 🙂 I just had some of those special ones lying around for the picture! No wonder you don’t care for it. Boxed cake? Just eat the candy if that is what you like and save the real stuff for me. I bought the caramels by bulk from a bin. How many do I use? Can’t wait to try this. Hey! I’d use roughly 2 cups of unwrapped caramels. Ok, it looks like I might be the only one that got confused but am i getting the caramels with the white center and melting those or am i getting the werthers chewys and usin those, sorry about the confusion, just want to make sure its perfect. I love carrot cake . It is one of the best cakes out there. My girlfriend would make me one for my birthday every year. I was one that thought ick at first, a vegetable cake, but I tried it &it was delicious. I love carrot cake, that is probably my favorite after chocolate cake . I have tried boxed versions but they are not even close to home made, So since I am a carrot cake lover I will give these a shot even though you are using a boxed mix. Ester, I think you’ll love these!